Over Thanksgiving weekend, Matt and I received a rather cryptic email from our favorite local pizza place, Pizzeria Lola. They wanted to know if we were available to be part of a shoot for a national television program the following week. Well, we were too intrigued to say no. We were told to show up Tuesday at 2:15 sharp prepared to be on filmed and interviewed and to keep the whole thing a secret. We went through the list of shows we thought it could be and in the end we guessed right with Diners, Drive-ins and Dives. If you haven't seen the show it features Guy Fieri visiting places around the country, cooking with the chef, trying the food and talking to the customers. We, along with twelve other people, were chosen to be the customers. This was our first time on a show like this and it was really interesting to see how it all works. First of all let me say, the photo above is a little misleading. We never say Guy Fieri. 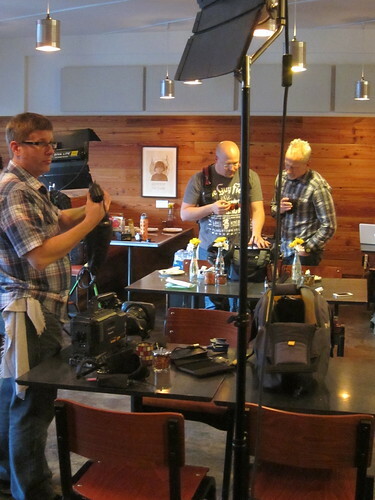 Each restaurant featured on the show is filmed two different days with Guy only there on the second day. We were there for the first day of filming. 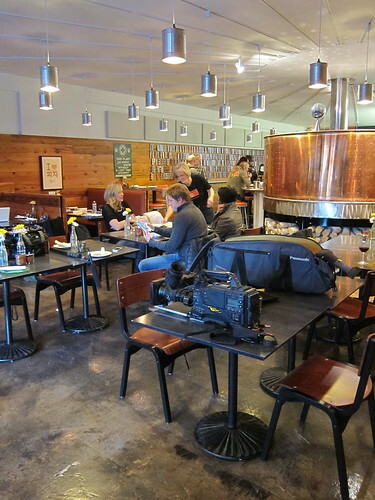 When we arrived, we were asked to tiptoe in and quietly take a seat while they finished filming chef Ann Kim make pizza after pizza. It was 2:15pm and they crew had been there since 7:30am working with Ann. It was kind of funny hearing her call pizza after pizza out to an empty restaurant. Next it was time for the "customers." The day we were there there were about 8 of us. I was so surprised because if you watch the show it always looks like it is happening in a restaurant that is busy and open for business. Apparently, they do this with a bit of tricky camera work. 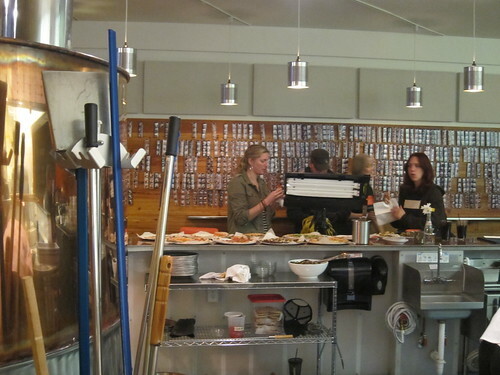 As the film crew filmed each group of people we were moved around to be background tables. Oh, it was tempting to ham it up in the background. Our table was the first up. We were given drinks and allowed to chose our favorite pizzas. 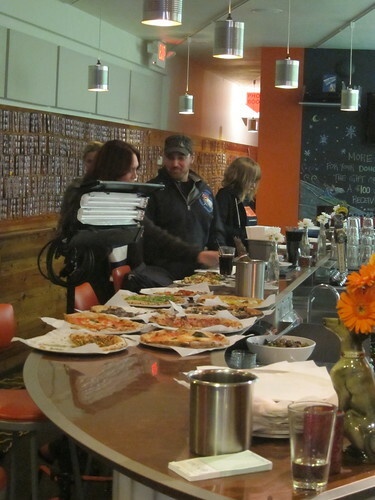 First they filmed the sequence of pizzas being delivered to our table, and delivered, and delivered until it was just right. Next, we had to eat, completely with close-ups of us taking bites of hot cheesy pizza. I'm so not sure I want to see that shot! Then it was time for our interviews. As Guy isn't there, a producer asks us questions off camera. We are given instructions to answer making sure to include the question in the answer so viewers will know what we are talking about. That is so much tricker than you think. We ended up having to answer the same question a few times to get it right. Luckily, the crew was a lot of fun and kept us laughing and in good spirits (the free wine and beer helped too). The funniest bit was when we were each asked to take a bite of pizza and describe what we tasted. You really get a good idea of how hard it is for tv hosts to do that take a bite and talk right away thing. We spent about two hours eating pizza, drinking and being filmed. Then the shoot was wrapped up for the day. The crew got to eat all those pizzas Ann made and she got to get ready for dinner service. She had to do another day of filming on Thursday and then we hear the crew came back for more shots on Saturday. We'll hear about four weeks before the episode runs, so we'll be sure to let you all know. I would have loved to have take more pictures of the actual filming for you, but it really wasn't possible since we were on camera most of the time. We don't know if they'll use any footage of us, but it was certainly interesting seeing it all from the other. Kathy! That's so freaking awesome! You just can't tell that's how they shoot it when you watch. Make sure you let us know! Very cool! I love Diners, Drive Ins and Dives. My only claim to fame is being on Hoboken own's Cake Boss. I can't wait to see this episode! How cool! And how interesting to see how things actually work for these shows! Wow! I love triple D...very interesting how it all comes together. Keep us posted on the air date. what an exciting day! i love that show unashamedly, and i look forward to seeing your episode! So interesting to hear about how the filming is really done!. i am not a Guy fan but I make an exception for DDD. Sounds like so much fun! Can't wait to see the show. I found this intriguing. We have to know, everything doesn't just happen but it is more contrived than I thought. What fun, it must have been. No way! That is too cool! It's a bummer you didn't get to meet him, but awesome you will be in an episode. I can't wait to see it! We have it on DVR so we should catch it for sure. I watch this show all the time, I will definitely look at it differently now. Thanks for the insider scoop. Coolness! I had no idea that they break the filming up that way. 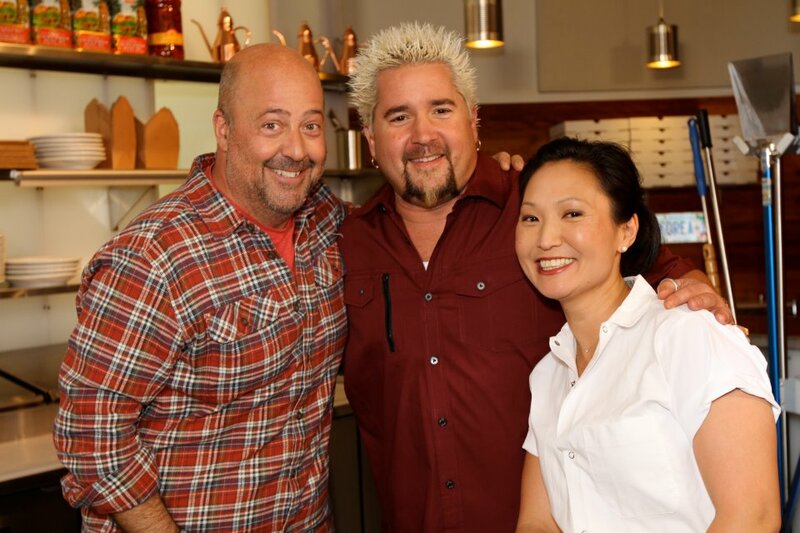 The people in the restaurant always seem like they just happen to be there on the same day as Guy Fieri. Pretty neat experience for you guys. Can't wait to see the episode. I was in the area (my best friend lives literally across the street from Pizzeria Lola), fortunate enough to see Guy out there that day, but I have to ask: Why is there not at least one picture of the SS Camero w/Calif plates that was parked on Xerxes with the top down? From any angle, you could've seen snow on the ground. That's something you'll never ever see again in your life. Zach - Since I wasn't there the day Guy was the car wasn't there either, so no pic from me! Well, that's fun! Hope you guys enjoyed yourselves! So much fun - I didn't even think of staging the audience for the shoot but it makes sense. That would have been a memorable day. Very cool. Your 15 minutes of fame is very exciting! I love it. And how interesting - the bones of filming. I never realized any of that. How fun! You're so lucky!